Surrender to the sensory journey within. Brace your senses as the 5th Backdoor Ventures Arts and Music Festival takes you to a bigger venue… with an even greater roster of acts never before gathered under one roof! The annual art gathering is the pioneer of all arts and music events in the country. Now on its fifth year, the Festival promises to showcase a grand lineup of activities, workshops, and performances that it is known for, raising the bar to a spectacular level year after year. With its growing audience and list of participants, Backdoor Ventures is moving to a bigger venue. 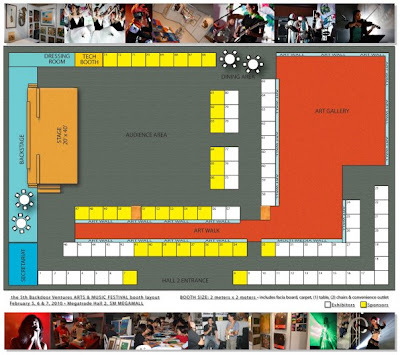 This year it will be held at the Megatrade Hall 2 – a larger space adjacent to Hall 3, which has been the Artsfest’s home for the past years. “We’re taking the next festival to a higher level as we celebrate the 5th staging of one of the biggest if not the biggest gathering of artists and musicians from different disciplines and genres in the country,” says Chief Event Organizer, Jay Viriña. Five years of bringing the people back to the arts and bringing the arts back to the people is definitely a milestone for the entire Arts & Music Festival family. As always, new and exciting activities will be added into the lineup. For one, schools and university organizations around the Metro will be taking a more active role in participating at this year's Festival. The hall layout and the stage design is also something to look forward to! 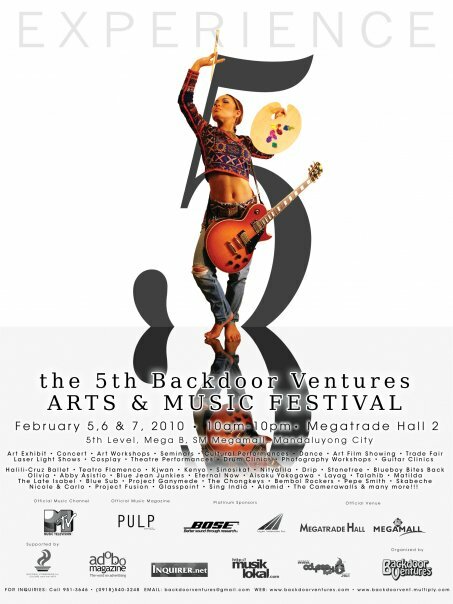 The 5th Backdoor Ventures Arts and Music Festival will be held on February 5-7, 2010 at the Megatrade Hall 2, SM Megamall. For inquiries and updates, call +632.951.3646 or +63918.540.3248. You may also log on to www.backdoorventures.blogspot.com and www.backdoorvent.multiply.com for more details.